translation: She was born on a Jesuit farm, where Nazaré do Piauí stands today. At 9 years of age, the Order was expelled from Piauí and she was taken as a slave to the house of Capitain Antonio Vieira de Couto. On September 6, 1770, she wrote a letter to the governor, Gonçalo Lourenço Botelho de Castro, denouncing the maltreatment that she suffered. She escaped soon after, reappearing in the record in relation to workers on a farm, dated 1778, married to an Angolan named Ignacio and with 7 children. 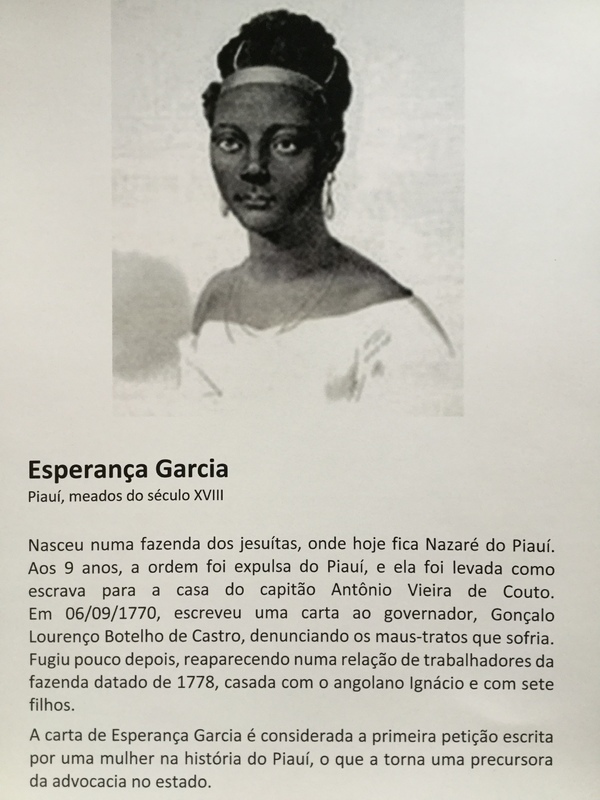 Esperança Garcia's letter is considered to be the first petition written by a woman in the history of the State of Piauí, which became the precursor to advocacy in the state.